It happens that we’ve been away just when films we had been planning to see came to local cinemas, and went. This week we caught two of them: The Imitation Game and Mr Turner. I thought I knew about the cracking of the Enigma Code by Alan Turing, that he was a genius, an outsider and that he had committed suicide. I thought I had always known it, but according to the oddly named film (presumably referring to the mathematical tactics involved, the code-breaking machine imitating the code machine to decipher the messages), Turing’s code-breaking was a secret for 50 years. I did realise that his autism wouldn’t have been understood because this condition didn’t become widely recognised until the 1960s, too late for him. I was also fascinated by the problems of ‘faction’, particularly in a film that had a documentary feel about it and was shot in black and white. The reconstruction of the war years was meticulous and must have cost a fortune with all the extras used and costumes created, though perhaps old film was cleverly integrated. Miss Clerk, the young woman with a double first in mathematics, sensitively played by Keira Knightley, seemed to be shoe-horned in for the required ‘female interest’, not an authentic player in the decoding drama, though Turing did propose to her, then withdraw his request. As a writer, I noted the plot with its neat rhythms of calm before a danger. Would World War II have been lost without breaking the Enigma code, as was stated a number of times? What about the Battle of Britain? If that hadn’t been won, there would have been no chance for the later help when the USA declared war and certainly shortened it, saving many lives. If Hitler hadn’t ignored history and made the same mistake as Napoleon who invaded Russia, to be defeated by the Russian winter, he would have probably made repeated attempts to invade England so it couldn’t become the aircraft and soldier carrier for the Americans. There was a tense moment, after Turing had finally realised that he needed the help of the other code-breakers he had previously dismissed, except for the convenient Miss Clerk, when, with the code deciphered, they realised that U-boats were about to attack a ship with one of the code-breakers’ brother on it. Turing refused to inform the War Ministry to try and prevent the attack as he said it would alert the Germans that the code was broken. Later on, when one of the code-breakers was revealed to be a spy for Russia, our ally, the MI6 boss said that he knew all along that the Russians had been fed information, and didn’t mind. That spy was the plump man who sat by Turing, unwillingly socialising in a bar and watching Miss Clerk (improbably his fiancée) dancing with another code-breaker. He was the one who whispered to Turing that he must be a homosexual. That was the John Cairncross I met, years later, in Italy. Now there’s a story for another blog! What shocked me was how recently such crude laws on homosexuality, even between consenting adults, existed in the lifetime of people living today. 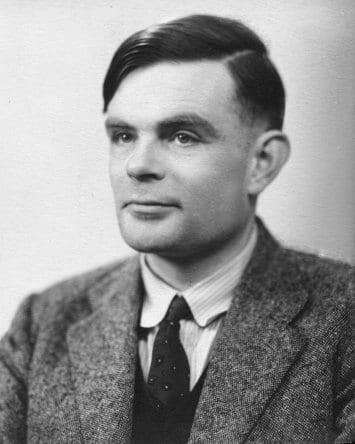 Turing was convicted for indecency (unexplained in the film) and his prison sentence converted into hormonal treatment for his sexual condition, a sort of modern version of medieval torture. Why is it so hard for some people to live and let live within an agreed legal framework which is constantly revised? Why is tolerance so difficult for some? It must be an inability to accept anything outside the perceived social norm. But when it concerns only adults in private, who has the right to pry when no one outside is harmed? Why is priestly celibacy still enforced in the Catholic Church when it is nowhere in Christ’s teaching and was only enforced later on, sometime in the Middle Ages when priests were passing property given to the church on to their children? Why was I spat on when I talked about the earliest humans coming out of Africa and spreading, as they multiplied, east into Asia and west into Europe, and eventually from Asia into North America then joined to Alaska before the Bering Straits were formed? I don’t know why. God could still create the first spark of life that eventually led to our ancestors leaving Africa in search of a better life. I’ll return to Mr Turner another time.